One fine day-Lady day, it was, and that, as everybody knows, is one of the greatest of holidays in Ireland-one fine day, a young fellow named Tom Fitzpatrick was taking an easy sort of a stroll in the fields, going slowly along the sunny side of a hedge. All of a sudden, he heard, low down, a small click-clacking sort of a noise in the hedge. "Isn't it surprising now," said Tom to himself, "to hear the stonechatters singing at this season?" So Young Tom stole on, going on the tips of his toes now to try if he couldn't get a sight of the bird-just wanting, you understand, to know if he was right in his guess. Then, as he looked sharply through the bushes, he saw something. It wasn't a bird that he saw, but a great big brown pitcher, that might hold about a gallon and a half; and stranger still, close by it, sat a little wee teeny tiny bit of an old man. 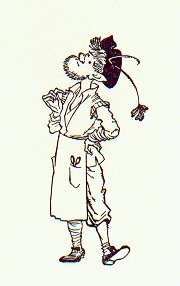 He had a little cocked hat stuck upon the top of his head, and a deeshy daushy sort of a leather apron and, as Tom watched, the little fellow pulled out a little wooden stool, stood up upon it, dipped a little piggin jug into the big pitcher, took out the full of it, and put it down beside the stool . Then he sat down again close under the pitcher, and began to work at putting a heel piece on a little bit of a brown brogue shoe just fit for himself, and the knocking of it was this very same small click-clack of a sound that Tom had first heard. "Well, by the powers!" said Tom to himself, "I often heard tell of the Leprechauns, but Truth! I never rightly believed in them-but here's one of them-no mistake about it! If I only go cunningly I shall make my fortune. But they say a body must never take their eyes off one of them sort of creatures, not for a moment, or they'll surely escape." So Tom stole on to within arm's reach, just as a cat creeps up to a mouse, with his eye fixed on the little man. "God bless your work, neighbour," said Tom with his eyes fixed and his hand ready. The little man raised up his head. "Thank you kindly," says he. "I wonder you'd be working on the holiday!" says Tom. "That's my business, not yours," answers the little man. "Maybe you'd be civil enough to tell what you've got in the pitcher there?" asks Tom. "That I will," says the tiny old man. "It's good beer." "Beer!" says Tom. "Thunder and fire! And where did you get it?" "Where did I get it, is it you're asking? I made it. And what do you think I made it of?" "The Deel knows," says Tom. "Malt and hops, I suppose, what else?" "There you're out," says the teeny weeny man, "I made it of heather." "Of heather!" says Tom, bursting out laughing. "Sure you don't think me such a fool as to believe that?" "Do as you please," answers the little man, "but what I tell you is the truth. Did you never hear tell of the Danes?" "Deed and I did, but what about them? says Tom. "Why, when those Danes were here, they taught us to make beer out of heather, and the secret's in my family ever since." "Well, and isn't it the clever little fellow ye are! Will ye give me a taste of your beer?" says Tom. But the little man looked angry at that. "It would be fitter for you, young man," said he with a frown, "to be looking after your father's property than to be bothering decent quiet bodies with foolish questions! Look yoonder! Can't you see! There's the cows have broke into the oats and are knocking it all about," and with that the little thing pointed behind Tom's back. "Come along then a couple of fields off, I suppose I'll have to show you where I've hid my gold." "Dig under that boliaun, and you'll get the great crock! All full of guineas it is!" Now, Tom , in his hurry, had never thought of fetching a spade, so now what was he to do? He thought for a bit and then he made up his mind that there was nothing for it, but to run off home as fast as he could and get one; but, so that he might be sure to know the right place again, he took off one of his red garters, and he tied it fast round the boliuan. Then he said to the Leprechaun, and he spoke very suspicious like"
"Swear to me that you'll not take that garter away from that boliaun!" The Leprechaun swore right away that, Faith, he wouldn't so much as touch it. 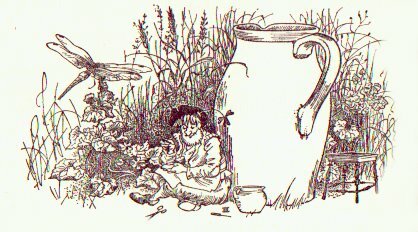 "I suppose," ended up the Leprechaun, and he spoke very politely, "you won't be needing me any more?" "No," says Tom at last, after he'd thought a bit more. "You've sworn not to touch the mark I put on that boliaun to know it again, and so I don't see that I'll be needing you. Yes, you may go now. God speed you, and good luck attend you." Good-bye to you then, Tom Fitzpatrick," said the Leprechaun. "And much good may my crock of gold do you when you get it," and with that Tom set the little thing down and away it went. As you can guess, Tom ran home for dear life, found a spade, and then back with it, as hard as he could go--back to the field of boliauns. But, oh dear! When he got there, what did he see! It's true the Leprechaun hadn't touched the mark, but now there wasn't a boliaun in the whole big field but had a red garter, the very model of his own, tied fast around it! What was Tom to do? To start digging up the whole field, that was all nonsense, for there were more than forty good Irish acres in it! Indeed, Tom soon saw there was nothing for it, but to go home again with his spade on his shoulder, a little cooler than he went. Many's the hearty curse he gave to that Leprechaun every time he thought of the neat turn he had served him.